We have made our way through the 2017 Braves prospect preview position by position and today we wrap it up with yet another area full of depth, the outfield. Like many of the other positions on the farm, the outfield is loaded with talent, but most of them are just a few years away from major league ready. 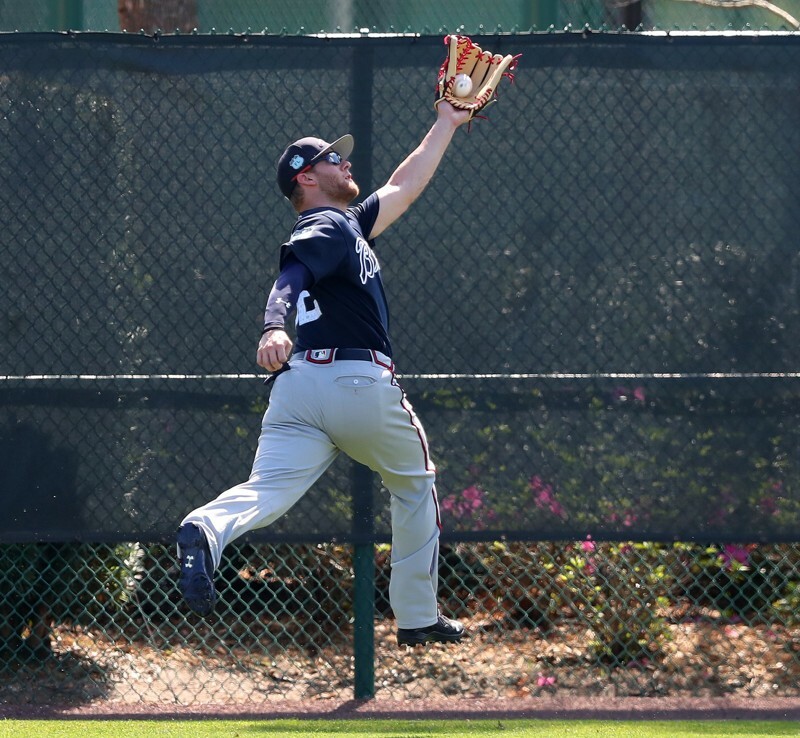 The Braves are set at center field for the next five years with Ender Inciarte, but the same cannot be said for the two corners. Nick Markakis has been seen as somewhat of a model of consistency for Braves fans, but his contract is up after 2018, which may be perfect timing for one of the outfield prospects to be ready for the show. Matt Kemp showed a nice resurgence after joining the Braves in 2016 and has come into spring ready to make a run at returning to all star form. He does not become a free agent until 2020, but that might be the time frame we are looking at for the top outfield prospects in the system to join the team in Atlanta. If you have yet to hear about the man, the myth, the legend of Ronald Acuna this spring, you haven’t been paying much attention to baseball. The 19 year old Venezuelan top prospect only played in 42 games last season due to a thumb injury, but made a big impact in Rome when he was healthy enough to take the field. While the scouting reports were always very positive on Acuna, he really took the baseball world by storm this winter when he slashed .375/.446/.556 over 20 games in the Australian Baseball League. Drawing comparisons to Braves great Andruw Jones, Acuna is considered to have a plus arm and glove, but he is really going to make his mark with his speed and bat. His raw power is his best tool and when you combine it with his excellent speed it is fair to predict Acuna could be a 30/30 guy down the road. With a few years to go before he is major league ready, 2017 will be all about Acuna staying healthy and staying on the field. Unfortunately, Pache is a guy we did not get to see a whole lot of last year when he split time between GCL and Danville. Just 17 years old at the time, the product of the Dominican Republic made a case as a Braves top prospect after his first professional season. Pache will be 18 for the duration of the 2017 campaign and will more than likely earn a promotion to Single-A Rome to start the season. Possessing a true Center Fielder skill set, many people believe he has the potential to stick at the position. Obviously the natural ability is there, with some more instruction and continued improvement at the plate, we could see Pache take a step up in levels year by year. The future is very bright for him. The closest to major league ready of all the outfield prospects in the system, Peterson spent the entirety of 2016 at Double-A Mississippi where he was outstanding both at the plate and in the field. He was originally a third baseman in the Padres organization after they took him in the second round of the 2013 first year player draft, but the Arizona native made the switch to left field after he was dealt to the Braves in the Justin Upton deal. A very impressive slash line is always nice, but when you combine it with some promising numbers defensively, a player’s stock will rise much faster. Peterson served as the M-Braves everyday left fielder and made only four errors on 236 total chances. Currently rated the 18th best prospect in the Braves system, according to mlbpipeline.com, Peterson was thought to have a chance to make it to Atlanta at some point this season and many thought he might even break camp as the fourth outfielder on the opening day roster. However, a March 3rd surgery on his left hand has slowed down any talk of him making it to the show anytime soon. It will be interesting to see what the Braves elect to do with him once he is cleared to return to action. Another Center Fielder, Didder has great speed and a very strong arm. He reacts very well to the ball coming off of the bat and has the speed to make tough plays look routine and make spectacular plays that would be impossible by many others. A 2016 South Atlantic League all star, Didder used that speed of his on the basepaths as well. The native of Oranjestad, Aruba stole 37 bases on 49 attempts last season which was good enough for fourth in the SAL and surprisingly second on his team behind Anfernee Seymour. The .387 OBP is very promising with a prominent base stealer like Didder and if he can develop some more gap power he can become a significant offensive threat. The 22 year old spent a majority of the season in center, but played about a third of his games in right as well. Davidson has been considered a top prospect ever since the Braves took him in the first round of the 2014 first year player draft. Still just 20 years old, Davidson has earned promotions each of his first three years of professional baseball despite a career minor league average of .232. The key for Davidson is to get his bat going as that was his most highly touted skill coming into the draft. He is solid defensively, but won’t exceed any expectations. I believe Davidson will repeat in Advanced-A this season in hopes of getting the swing on track. It is important to keep in mind his age while the Braves slow down his developement slightly. He still has plenty of time.